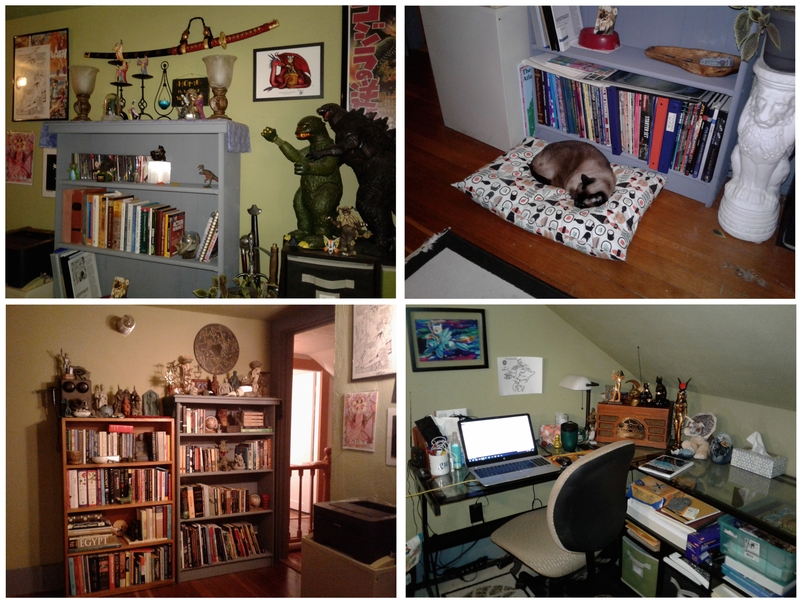 As a writer, I deal with spaces every day. They are the gaps I place between my words so that each one stands out on its own with legibility and respect. One could even say that it’s in between the spaces of prose that all the action happens, and that far from being empty voids they are in fact the ocean of imagination upon which stories are born. But spaces are also the places in which we live and create our lives. And this weekend I paid some overdue attention not to the spaces on the page, but to those within my home. My living room, right now. My wife and I share a deep love of the holiday, and decorating our home together for it is an annual tradition for us. 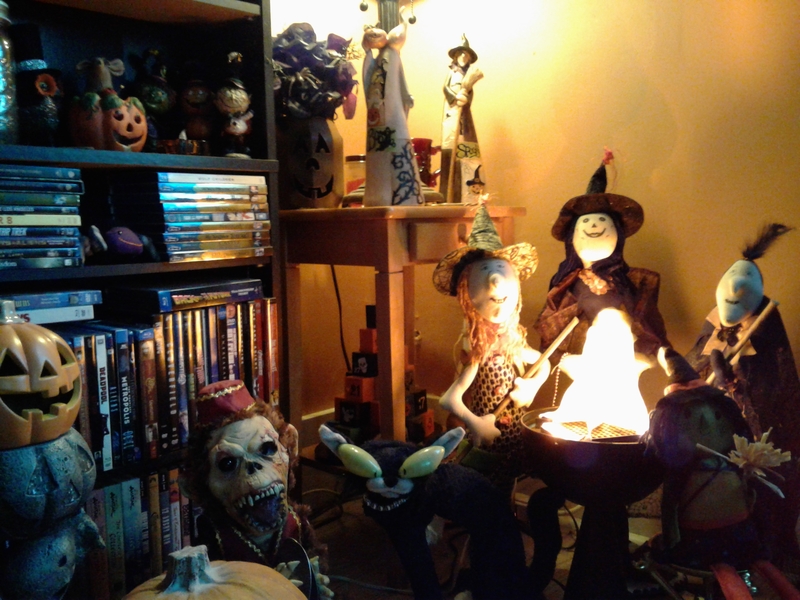 We also host a Halloween gathering and party, and as our house has gotten (cough) into a little disarray, there was a lot of cleaning and organizing in need of doing as well. This alone is normally an all-day undertaking involving thirteen tote boxes of stuff, plus some requisite housekeeping. But this year we added unpacking an equal if not greater amount of personal items that had been stored in our basement since we moved in 2015. And that’s how it went: For every item we found that we were looking for, we unpacked two things that we hadn’t planned on pulling out. We also were entirely unprepared for the emotional torrent seeing our items again would release. You see, although we love the nearly one hundred year old fixer-upper we live in now —and it’s an improvement in every way to our prior dwelling— our move into it was done under duress. We were forced from our old home in 2015 when the holder of the second half of its mortgage refused reasonable negotiation and monthly payments to buy them out. Instead they chose to make a quick cash grab of the property we had spent eight years living and investing in. It stung even worse that this person was once a very close friend, the daughter of the nice old man that had helped us purchase his old space with a second loan through him. He wanted to help us out, but then he died and, well… then it becomes an old story about seeing the true nature of people when they get some power. About what happens when they stop listening to their better natures, and let greed make the choices for them. Such transformations into a villain are pretty dramatic, and saying that it ended the friendship and the satellite friendships around it is insufficient. It’s the pain of being reduced to a dollar value, and of being referred to as a “retirement fund”. It’s the rage of having to stand silent as your wife is belittled as a worthless failure. Of having your choice and dream to be a writer mocked and derided as you beg for a little time so that your family isn’t left homeless, from someone who couldn’t care less. The bad-guy won that time. Well, they won what they thought they wanted. But as fate would have it, my wife and I found our new space thanks to a conspicuous string of favorable coincidences, good people, and hard work. In the end this placed us in a far, far better home and living situation than before. As for the villain that forced us out, the tale ends with a bit of poetic justice: After she spent a considerable sum to improve the old property, we suspect she ran short of cash due to poor financial planning. We say this because after an oddly quick sale, our estimate is that they netted less for the house then than what we had originally offered them to buy their half of the mortgage in the first place. And that’s after she spent all that on fixing it up. At least the folks that ended-up buying it got a good value. Still, the move was a traumatic and emotional upheaval for us. At the time, we couldn’t afford the luxury to process the pain: We had a house to repair and make fit to live in before winter. So we stuck our old life in boxes, hid them in the basement, and moved on with a Spartan household. And Saturday, it had been over two years later and it was all still down there. Like a wound you don’t want to look at. It was stressful and joyous at the same time, to be reunited with our old things and the memories attached to them. The ghosts of our previous home walked and sat with the boxes of Halloween decorations. They sang happy songs, and they sang sad songs. Finally my wife and I just had to hold each other and cry amid the chorus. Placeholder objects were moved away, and we integrated the old things into our new spaces. Kim and I spent time and talked. The great eruption of reclaimed treasures spurred me to stay up half the night and refine and organize my writer’s study: I sorted my books properly, hung pictures and things that had been lying around for years awaiting me to do so, and arranged the items of meaning to me while forging a better creative sanctum. By Sunday night, it was done. We were exhausted, but much of the love and cherished memories of the old home had joined the new. And that was my weekend. I spent it filling spaces, and reconciling with the emptiness. Good stuff man, good luck!